Hi. 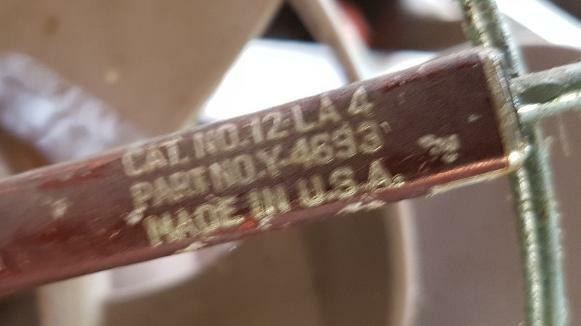 I have a Westinghouse oscillating fan (maybe a 12LA3) that has been in the family since new. It was working great until last week, when the resistor for the low-speed setting burned out. Does anyone know where I can get a flat-pack ceramic resistor to replace it? I also have the same fan as you and mine had the same exact resistor pack in it that was also blown in two from the resistor catastrophically failing due to getting too hot and so I'm in the same position as you as far as trying to find a new resistor for the low speed on my fan but so far I haven't had any luck. We built a step down for my 39 chevy from 12 to 6 volt so I can run some of the original equipment. That looks like it will work. I will let you know when it arrives. Just keep in mind that there is no such thing as a resistor that drops a certain amount of voltage. (Many think there is such that makes 6V from 12V!) It all depends on the current! Ohms law....Voltage dropped = Current squared X resistance. 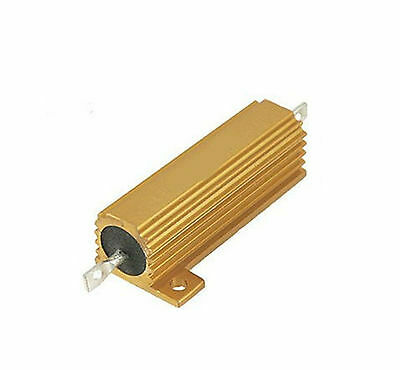 Best is to find a rheostat or selection of resistors to try. You can put them in series to add up for more choices. When you find the value that gives a nice low speed, look for a fixed resistor of suitable wattage. At this stage of these fans life, owners that have an all original example could perform a noble service to fan repairers everywhere. Disconnect from the wall plug, upend the fan, then measure the resistance with resistor out of the circuit. Then take that ohm reading, tack it to say, 25 watt resistor. You have what another fan might need. I have one of those but wont be able to get to it today. 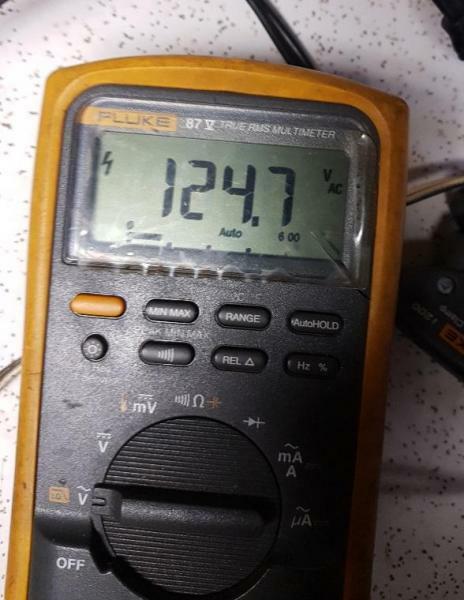 I have some 50 ohm and I think we used 3, 75 ohm to drop the 12 to 6 on the truck. I would buy two 50's and two 20 s and experiment. to get the speed you want. I will check tomorrow, I have a similar Westinghouse stored. My fan is a 12LA4.It has a 35 ohm resistor. Mines a 12LA3 so I'm not sure if that makes a difference in how big or small of a resistor they had in the base for speed reduction or not but I know mine had a ceramic cased resistor in the base that was sandwiched between two pieces of aluminum that acted as a heatsink that screwed into the base of the fan as opposed to the mica based resistors that were used in some of the other 2 speed LivelyAires I've seen. With mine the resistor failed by splitting in half right down the middle because of too much heat buildup and it caused the resistor to break/split in half down the middle which also left burn marks/discolored the heatsink material right where the resistor failed at. I've read in other posts here about the LivelyAires that some of them even had 47 Ohm Resistors in the base but that person said that theirs was the old Mica type resistor though so maybe the ones with the Mica resistors in the base were higher resistance than the ceramic type resistor base fans. Two of these will give you 35 ohms or a 50 AND A 25 should give you the 35 ohms you are looking for and more heat sink may have to add onto the resistor mount . Okay, I said I would post pictures. The main reason is to show that a 50 watt resistor or even a 75 watt resistor is not big enough (for my fan). First, here is the fan I am working with, a 12LA4. Here is the 35 ohm resistor. 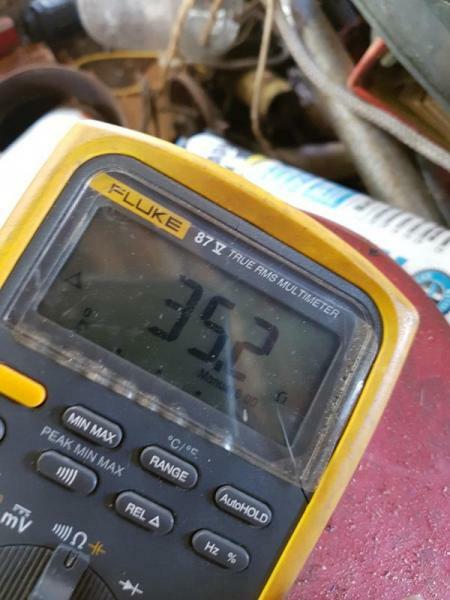 Thirty-five ohms is verified with a meter. but that is what I am working with. Next, I measure the current draw of the fan on high speed and note that it is dead nut on the nameplate amps. 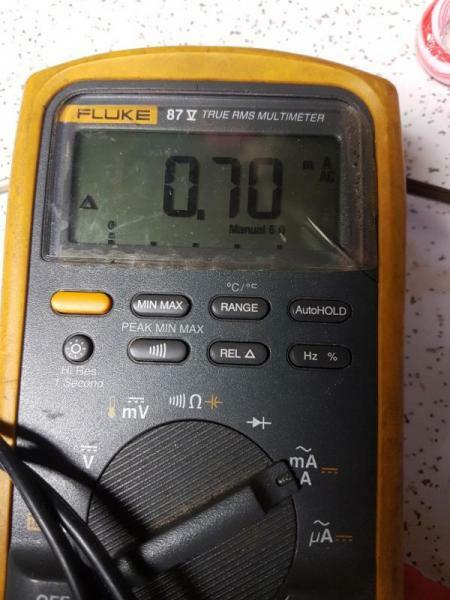 Finally, I measure the current draw of the fan on low speed and note the reading, 0.61 amperes. For a purely resistive load, watts equals volts times amps. so the current through them is the same and the resistor IS a purely resistive load. Therefore 0.61A x 124.7V = 76.067 watts. A 75 watt resistor is not going to work with any margin of error. The next size up is a 100 watt and that is what I would choose if I were shopping or scrounging for a resistor. Then 115v x 0.61A = 70 watts, in which case a 75 watt resistor would be adequate with a small margin of error. or any other reason, and modern wall is more than 115 volts, the resistor will eventually fail. Other folks may poke holes in my thought process, which is okay. I may learn something. Thanks for the info. Mine was the same type of resistor as your fan has but mine didn't have the Ohm value stamped on it like yours did. The household current in my house fluctuates between 117v and 120v according to my kill a watt meter. So I think a 75 watt resistor should be plenty big enough. Resistors are a El Cheapo, crappy way for a manufacturer to save a few cents for AC induction motor fan speed control!!! DC, and series wound fans that might be used on DC, Nichrome resistors are what is needed. If you can wind a speed coil, or use one from another fan, you will be much better off than a resistor! The trick is, DO YOU PHYSICALLY HAVE ROOM FOR IT IN THE BASE???? Maybe you wind a toroid speed coil? An inductor speed coil will save electricity when used in series with the AC motor. A resistor just creates heat, instead of giving the motor the extra energy. I would rather put in an electronic speed control rather than a resistor in an induction motor fan! Like someone once said: "We don't need no stinkin' resistors in AC fan motors!" This one someone put a strip of metal under the resistor to help heat sink.. If you can get some metal to put under the resistor to help heat sink it should do fine. My fan did run fine till I just now took the resistor out of it. heat is the problem whether you a resistor like I posted or a hand wound nichrome one.!! If you look at some of the old Star Rite fans you'll see slots in the base , this is to let the heat out from the nichrome resistor. If you want to use 35 ohms use 2 , 75 ohms in parall to make 35 ohms and twice the heat sink!! 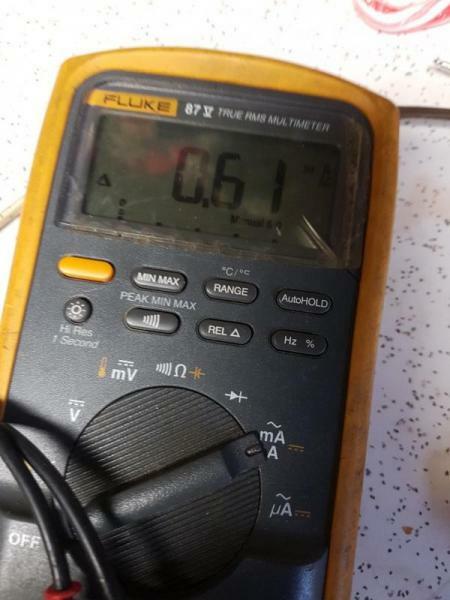 Charlie, The reason why your resistor reads 51 Ohms rather than 35 Ohms is probably because the resistor drifed up in value over the years (resistors often drift up in value over time especially your old carbon comp. resistors like what they used in old radios pre 1975 and these speed control resistors are no different). What does the aluminum frame on your resistor say? Does it have a resistance value stamped on it anywhere like what Mark Olson's does? Mine had some numbers stamped onto it but they've long since worn off due to heat and old age. As for that metal bar that the resistor is attached to, that was put on there from the factory as extra heatsinking material to assist the already existing aluminum heatsink that was attached to the resistor to disipate additional heat, as you could see Mark's fan has it too and mine did as well. John, I have a 3 speed speed coil assembly that I had salvaged from an old Spartan/Fasco fan that had a broken pot metal oscillator mechanism on it that I could wire up to my LivelyAire to make it a 3 speed fan rather than a 2 speed fan (3 speed LivelyAires did exist apparently as someone on here posted pictures of one previously) and the existing switch on the fan can be wired to be a 3 speed switch (its an off/on-a/on-b/on-a/b switch like on those old floor lamps where you had the 3 way candelabra sockets that turned on with a 3 way switch that turned on one light socket, 2 light sockets or all 3 light sockets and then turned it off again). I think if I could figure out how to wire it up to do so I think I could make this fan a 3 speed fan using the existing switch and the salvaged 3 speed coil. By the way the salvaged speed coil was a toroid/round speed coil that is fairly low profile and I just checked the base of my fan and it has plenty of room underneath to tuck that speed coil in under there, I would have to figure out how to attach it to the base, but I think just some epoxy and epoxy it to the base where the old resistor was originally might do the trick. I'd have to get the resistance readings from the speed coil to see which winding lead is for high which one is for medium and which one is for low. 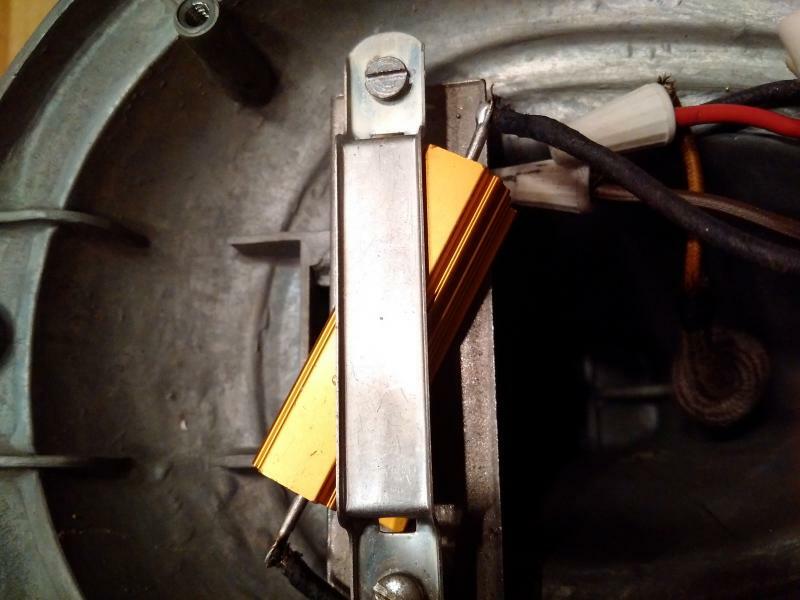 I do have an actual 3 speed (4 position) fan switch that I salvaged from the old Sparton/Fasco fan I had but the neck of the switch is too big to fit into the existing hole on the fan base. Check the link below, I think I may have sourced a company that makes a modern day replacement of the original resistor that was in the base of these old 2 speed Westinghouse LivelyAires. The only problem is that rather than rating the power of their resistors in Watts, they rate them in Amps which is kind of confusing, you can convert amps into watts but its kind of time consuming unless you use Google to do it. #7 resistors of the caliber that I referred to are very inexpensive. I don't see the waste heat as a serious problem, so for now, the resistor will stay put. The choke solution has an enticing appeal, but for now, I am just not that ambitious. Well my post was just to "humor" John's Comment as I'm in the same boat you are in as far as not knowing how to wind a speed coil on my own. Take a look at the link I posted, that company sells modern day equivalents to the old resistors that Westinghouse used in these old 2 speed LivelyAires they even have holes already built into them for fastening them to the fan's base. Levi Mevis wrote: Check the link below, I think I may have sourced a company that makes a modern day replacement of the original resistor that was in the base of these old 2 speed Westinghouse LivelyAires. The only problem is that rather than rating the power of their resistors in Watts, they rate them in Amps which is kind of confusing, you can convert amps into watts but its kind of time consuming unless you use Google to do it. I bookmarked the page because antique radios and amplifiers are one (sic) of my other pastimes. on startup or if something else is seriously wrong with the fan. what is the difference in my resistor and Johns speed coil? probably a couple of miles of wire. electrict is a lot the same as water!!! we will take a bucket of hot water and a short hose connected to the bucket and you open the valve and let the water run , it dosent take long and the hole hose is hot! next we put the long hose on and open the valve and it takes a lot longer to get the whole hose warm. Mark Olson wrote: Levi Mevis wrote: Check the link below, I think I may have sourced a company that makes a modern day replacement of the original resistor that was in the base of these old 2 speed Westinghouse LivelyAires. The only problem is that rather than rating the power of their resistors in Watts, they rate them in Amps which is kind of confusing, you can convert amps into watts but its kind of time consuming unless you use Google to do it. Thanks! Under the Replacement Resistor Menu Option of that website they have a link that says "Milwaukee" on it and that one has a 35.1 Ohm resistor that is rated at 4.6 amps, or a little over 200 watts which would probably be overkill for this fan but would probably not fail as easily as the original did. Levi Mevis wrote: Mark Olson wrote: Levi Mevis wrote: Check the link below, I think I may have sourced a company that makes a modern day replacement of the original resistor that was in the base of these old 2 speed Westinghouse LivelyAires. The only problem is that rather than rating the power of their resistors in Watts, they rate them in Amps which is kind of confusing, you can convert amps into watts but its kind of time consuming unless you use Google to do it. It would not fail unless the fan were locked rotor, and then the motor would probably burn before the resistor. Lets try it! have you got a "junk" motor? LOL just kidding! Powerohm Case ResistorsMark Olson wrote: Levi Mevis wrote: Mark Olson wrote: Levi Mevis wrote: Check the link below, I think I may have sourced a company that makes a modern day replacement of the original resistor that was in the base of these old 2 speed Westinghouse LivelyAires. The only problem is that rather than rating the power of their resistors in Watts, they rate them in Amps which is kind of confusing, you can convert amps into watts but its kind of time consuming unless you use Google to do it. 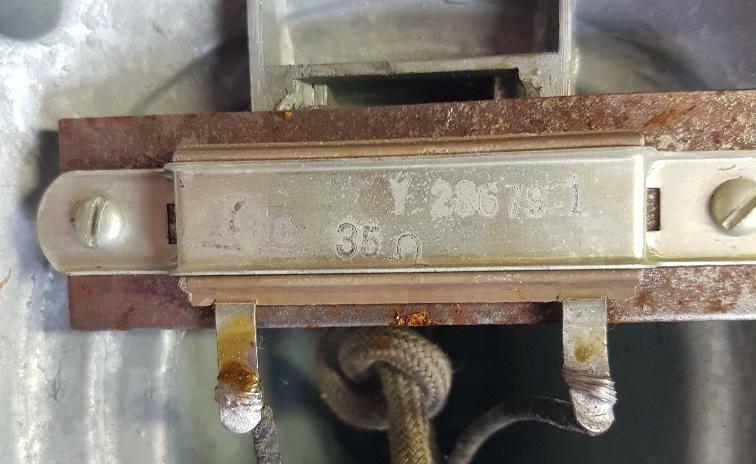 Here's another type of resistor I found at that same website I linked to earlier that has a much more similar design to the original resistor these fans used than the other ones I linked to in here, and they have a wattage range of 100 to 450 watts and a resistance range of 5 to 375 ohms. See link below for the spec sheet of these resistors. Those are overkill. Are they expensive? I have no idea what the price is of their resistors that they offer as they have no price sheet for their stuff, they just have a form for you to fill out for a price quote for their parts, which means you have to ask for the price for the parts you're interested in from them. Please let me straighten you out on the lamp switch versus the fan speed switch. Do NOT use a fan LIGHT switch with a SPEED COIL. PLEASE, only use a fan speed switch. The "additive" feature of the LIGHT switch will not work with a fan. It will give you 1 low and 3 highs. When you use a speed coil, if it has more than 2 connections, the highest resistance will be medium speed. I'm too lazy to wind my own coil, but I would be willing to try a speed coil from another similar sized fan. trying out components, before final wiring assembly. Ok, thanks for letting me know. I do have an actual 3 speed fan switch that came from the same fan as the 3 speed speed coil did, but like I said when I tried to fit it in the existing switch hole it didn't fit. So I'm not sure how you would fix that problem without having to drill out the original hole in the fan. Page processed in 0.2266 seconds (13% database + 87% PHP). 43 queries executed.